Plot Synopsis: What if you discovered that someone you once were best friends with disappeared without a trace? Would you believe it? Would you look for him? This is the very dilemma that faces Daniel and Stan in the critically acclaimed comedy/drama, Went To Coney Island On a Mission From God...Be Back By Five. When Daniel (Jon Cryer, Hiding Out, Pretty In Pink), and Stan (Rick Stear, Astoria) discover that Richie (Rafael Baez, Empire, Shanghai Noon), one of their best friends from high school, has vanished without a trace, they set out on a "Mission From God" to Coney Island to find him. But what they discover along the way, could change their lives forever. 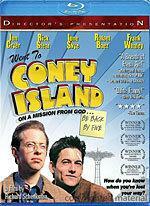 Went To Coney Island On a Mission From God...Be Back By Five features an all-star supporting cast including Long Skye (Say Anything..., Wayne's World), Frank Whaley (Pulp Fiction, Swimming With Sharks), Dominic Chianese (HBO's The Sopranos, The Godfather Part II) and Judy Reyes (NBC's Scrubs) and is directed by Richard Schenkman (A Diva's Christmas Carol, The Pompatus of Love). Based on a true story, Went To Coney Island On a Mission From God...Be Back By Five is a journey that goes from the hilarious to heart warming. Film critic Leonard Maltin calls it "A breath of fresh air...Moving and funny...A satisfying slice of life!" and the New York Times film critic A.O. Scott raves, "Quite funny!"